For the birthday of our son I made an apple cake. This recipe for a "sunken" apple cake ("Versunkener Apfelkuchen" in German) is from my Mom. 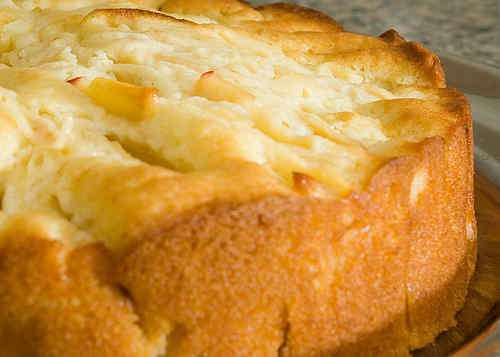 This cake is simple to prepare, tastes great and is best with sweet apples like Golden Delicious. Fortunately, we have an apple tree in the backyard. Peel, quarter and core apples. Cut into thin slices, sprinkle with lemon juice immediately to prevent the apples from turning brown. Add 60g sugar, stir carefully, set aside for at least an hour. Grease 10in / 25cm spring form with butter and flour. Preheat oven to 375°F / 190°C. Mix flour and baking powder. Sift. Whisk together butter, sugar, salt, vanilla extract and lemon zest. Whisk in eggs. Stir in flour-and-baking-powder mixture and milk. Start with ca. 1 cup / 120ml of milk and then add more until batter is smooth but not runny. Pour batter into spring form. Stick apple slices into the batter, upright and in concentric rings. Bake for ca. 45-60 minutes. Let cool, then remove from the spring form. This cake was so easy to make and tasted just like what my Oma and Mom used to make all the time. Thanks for the recipe! This is the first recipe that i take from the internet and that actually turned out good... better then good i would say, even my "i don't like apple cake" of a husband loved it and that says a lot. Das Rezept ist wunderbar, vielen Dank. Meine Oma hatte den Kuchen oft gebacken. Das Carbonara Rezept ist auch sehr, sehr gut. Ich bin von Kaiserslautern, ganz in the Naehe von Frankenthal. Nochmals vielen Dank fuer die Rezepte.